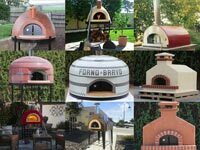 Forno Bravo provides six assembled home pizza ovens designed to meet a wide range of outdoor kitchen needs for your home. 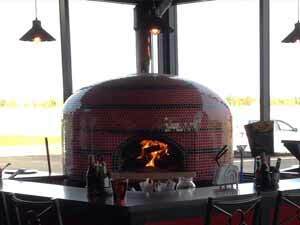 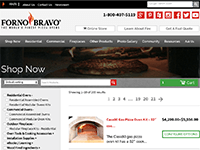 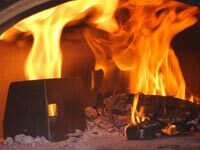 For more general information about Forno Bravo pizza ovens, their history, and our products, visit our pizza oven page. 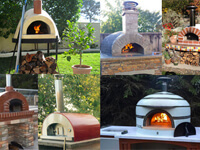 Scroll Down to See Community Inspired Styles, Sizes, and Customizations To Match Your Unique Vision! 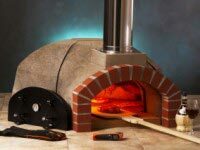 The Primavera Series is our most popular assembled pizza oven. 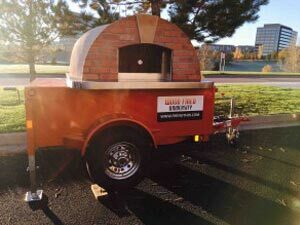 These wood fired ovens are available with 24″ and 28″ internal cooking surfaces, which provides plenty of room for a live fire and cooking 1 to 2 traditional Pizza Napoletana at a time. 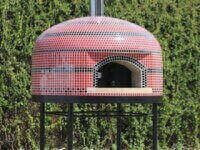 Easy to install and able to be taken with you when you move, this Forno Bravo pizza oven will last a lifetime. 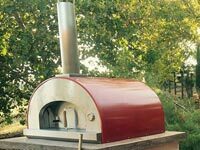 Capable of cooking as many as 50 pizzas per hour, this oven is a workhorse for the family on a budget. 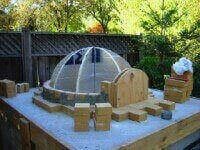 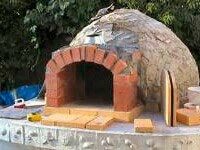 This fully assembled pizza oven comes in a beautiful handcrafted stucco igloo shape, available with or without a metal stand, and easily mounted on a countertop. 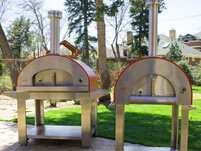 You can choose red or yellow (standard), or customize your color by choosing your own. 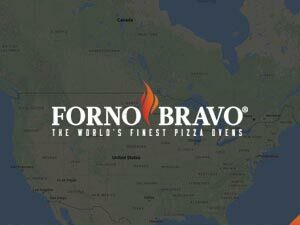 Made famous by Peter Reinhart, host of Pizza Quest. 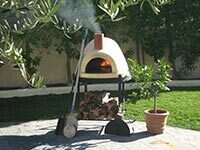 The Napolino Series outdoor pizza oven is a traditional Naples-style pizza oven with a center vent design, which is more fuel efficient than the standard front vent oven used on the Primavera and Andiamo assembled pizza ovens. 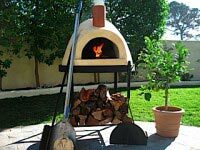 These wood fired pizza ovens are available in 24″ and 28″ cooking surfaces, allowing you to cook 1 to 2 pizzas at a time. 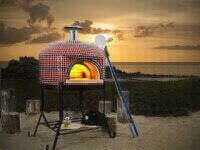 Capable of cooking 50 pizzas per hour, it can comfortably entertain most family gatherings. 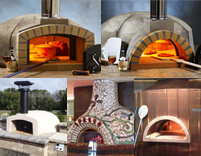 If you choose the Napolino, you are choosing a high performing oven, designed for an outdoor kitchen with limited space. 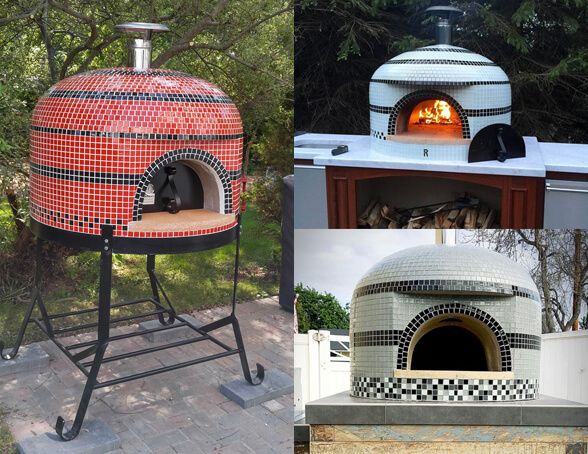 Available with or without a stand, it comes in a standard red and black tile pattern, or you can challenge our team to custom tile your oven to your exact taste. 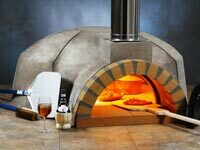 The Andiamo Series pizza oven is ideal for those who want a modern looking pizza oven with a traditional refractory construction. 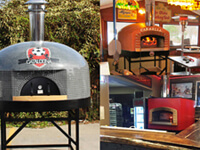 These ovens are available in 24″ and 28″ cooking surfaces, allowing you to cook 1 to 2 pizza at a time. 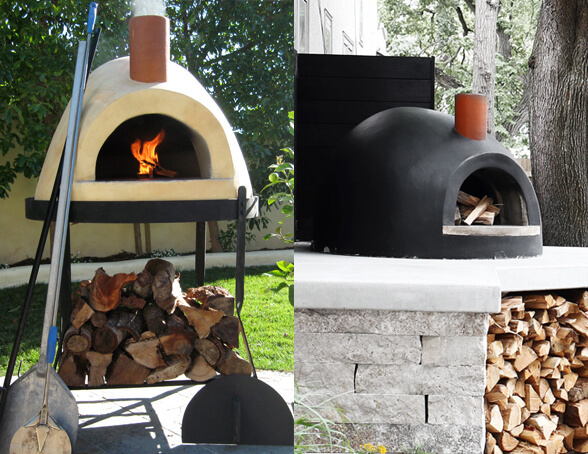 Capable of cooking 50 pizzas per hour, it can comfortably entertain most family gatherings. 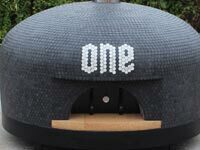 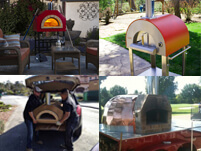 This outdoor pizza oven is installed on casters that allow you to move it around your patio. 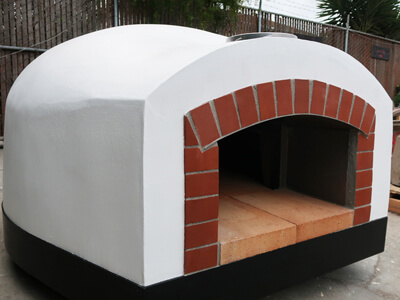 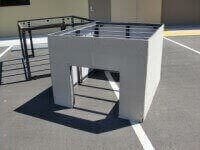 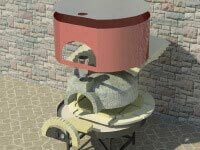 Weighing between 600 and 800 lbs, the pizza oven can be rolled by two people on a level patio. 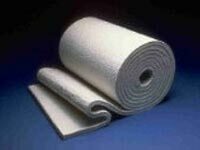 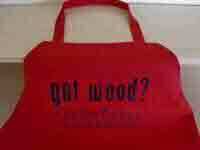 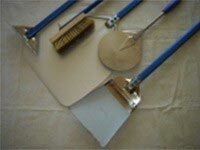 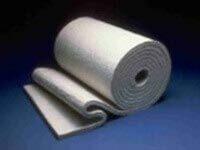 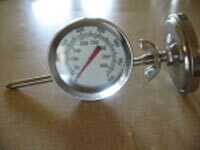 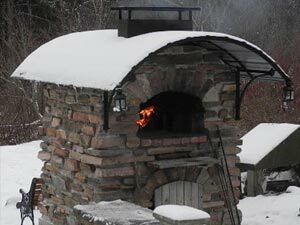 Especially useful if you live in an unpredictable, windy climate and need to position the oven differently each season. 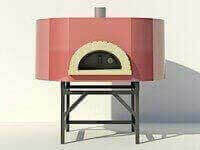 All Andiamo ovens come with a powder-coated steel stand and locking casters. 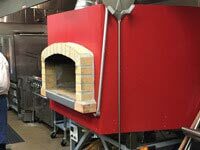 Available in red or bronze powder-coated steel enclosures. 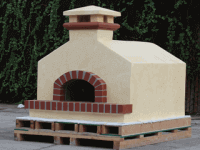 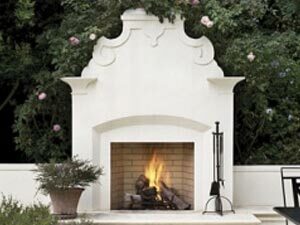 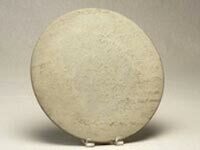 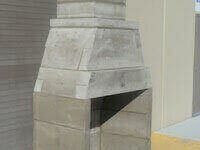 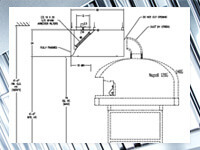 The Toscana Series oven is built using a 2″ thick refractory dome. 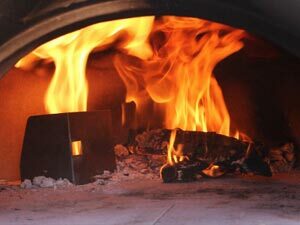 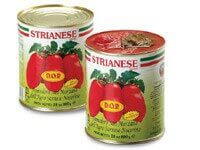 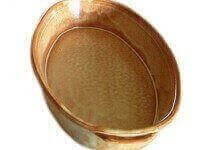 This added thickness requires a little more heat up time than its smaller cousin ovens, but can produce more food without losing heat. 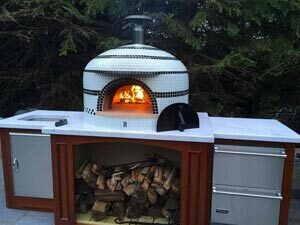 Ideal for people who entertain large groups of people in their outdoor kitchen. 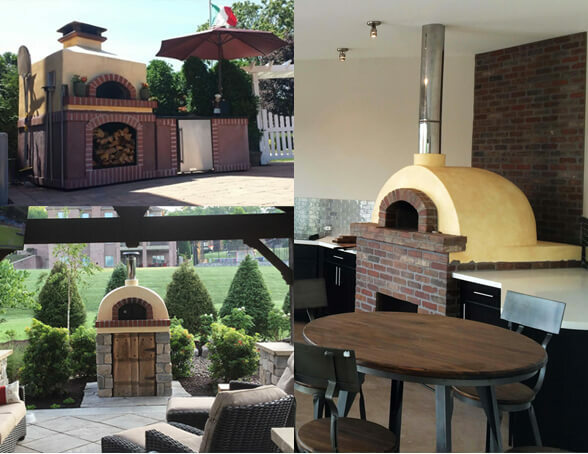 These home brick ovens are UL certified for indoor or outdoor installation, but typically are only used outdoors, under covered patios, or in screened porches. 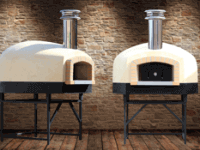 These pizza ovens are available in 32″, 36″, 40″ and 44″ cooking surfaces, allowing you to cook 2 to 5 pizzas at a time, and up to 100 pizzas per hour. 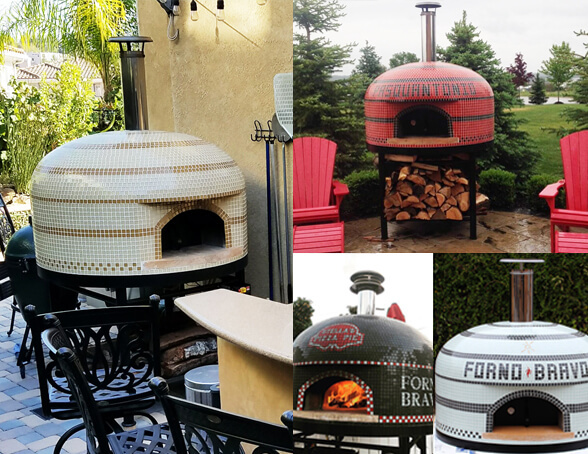 The Toscana assembled pizza ovens are handcrafted in a stucco finish and come in three different styles — Mediterranean dome, gabled, or hipped. 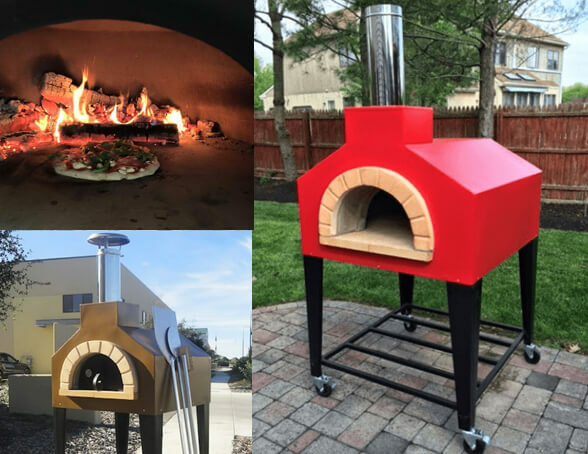 Choose red, yellow, or a custom color to match your decor. 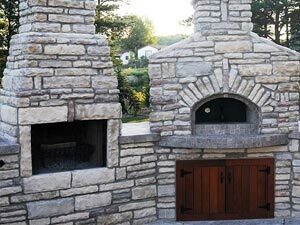 Although this oven is not available with a stand, it can be matched up with our Cucina Stand product line if you do not want to build a traditional masonry hearth. 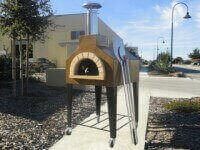 If you want to see this oven in action, check out Chef Lea cooking a Thanksgiving Turkey. 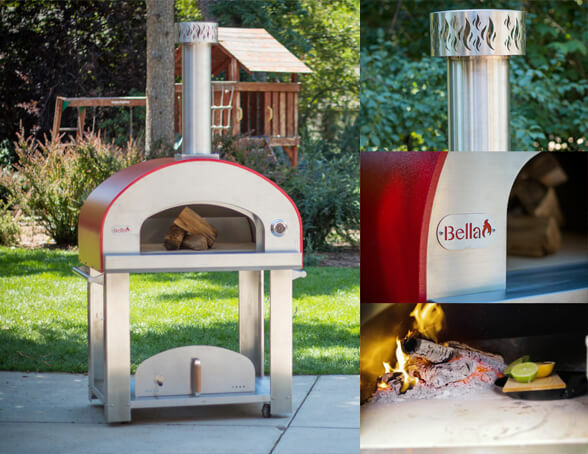 The Bella brand of products is Forno Bravo’s answer for those who want a wood fired pizza oven, but desire the lightweight advantages of stainless steel construction for portability, and faster heat-up and cool-down times. 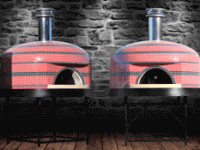 These pizza ovens range from the 28″ Medio all the way up to the 40″ Ultra. 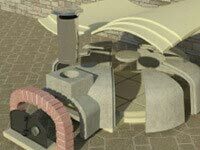 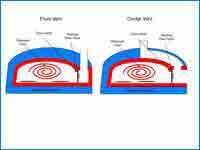 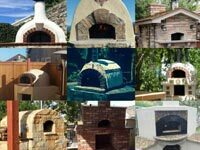 Increasing in popularity, these ovens can cook everything a traditional refractory oven can, it just takes a little longer. 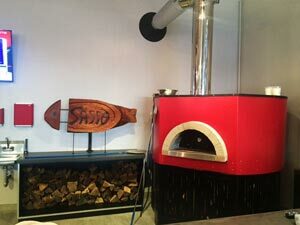 For some examples of great recipes using a Grande 36″ Bella Oven, check out Chef Brigit Binns’ recipes in our Community Cookbook or in her specially designed recipe e-Book, Kissed by Fire. 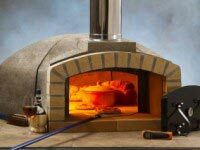 All Forno Bravo assembled pizza ovens are handcrafted from our proprietary refractory material, fully insulated, and include venting, a powder-coated metal door, and thermometer. 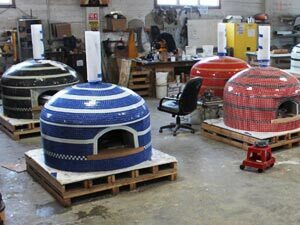 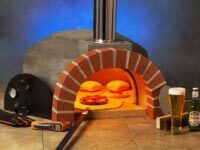 If a fully assembled oven exceeds your budget, or you simply want the satisfaction of building your own oven, check out our modular pizza oven kits. 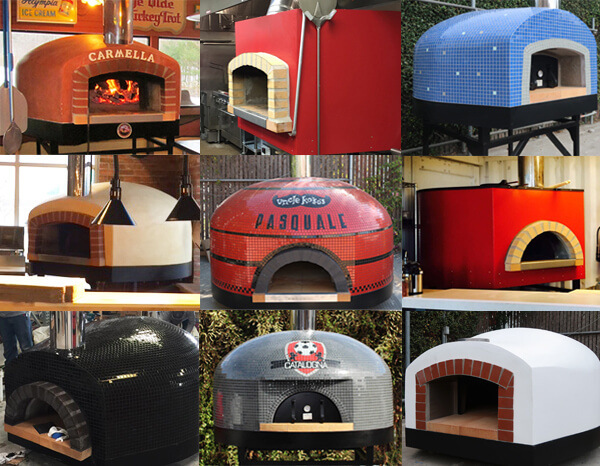 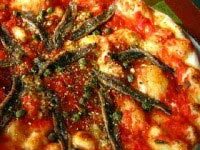 And don’t forget our Forum with over 26,000 registered users sharing pizza ovens built all over the world with photos, advice, and fun stories. 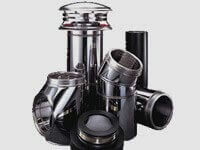 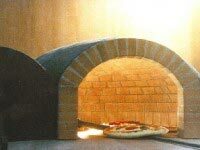 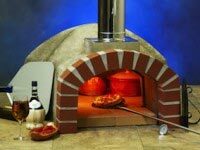 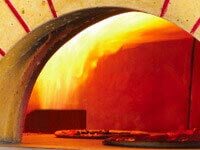 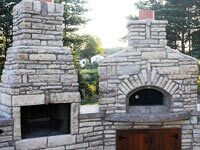 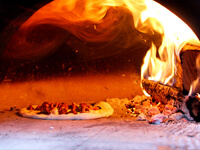 For more general information about home pizza ovens and our products, visit our pizza oven page.